3.) an autobiography with emphasis on the spiritual aspects of the author’s life. The autobiography depicts what happened after Anandamaya das became complacent, neglecting his sadhana after years of practice and getting involved in motorcycling. After a nearly fatal motorcycle accident in April, 2008, emergency surgery was performed. After surgery, nurses began giving morphine for pain relief. As we know, one cannot get something for nothing within the confines of matter. A severe reaction to the morphine ensued, and the author began having hellacious visions, becoming entrapped in a grisly world of negative energy. Suddenly and quite unexpectedly, Krishna saved him and what happened next is truly fantastic, and comprises the heart of the book. Excerpt: "About this time, I began visiting the Victoria Public Library on a regular basis and reading more philosophy. One day I stumbled upon Krishna Book which was a summary study of the tenth Canto of Srimad Bhagavatam (3) describing the pastimes of Krishna during His Appearance (advent) on earth some 5,000 years ago... A little later I met a devotee preaching couple from Vancouver Iskcon, Partha das and his wife Uttama dasi, and we became friendly. Then I met some men devotees from that same temple: Padmapani das, Krpanidhi das and Mahesha das, who were preaching and passing out literature in downtown Victoria, and we became friends. About this same time Vishnu-jana Swami and his men came through Victoria to set up a booth at a local fair. They stayed with me for a week and I got to drive VJ Swami on some errands. I remember him being very genuine, warm and open, but myself acting somewhat egotistical to him. After that I invited some of the Vancouver brahmacaries (monks) to come visit at my apartment. They came and stayed (partly to preach and partly to save money by not having to stay at a motel), but the early morning kirtans (congregational chantings) were too loud for the other residents of the small apartment complex. Complaints ensued from the manager, so I had to ask the devotees to leave. They urged that I shave my head and move into the Vancouver temple. Since I was already practicing on my own, I didn't see the need for that. At that point, we essentially parted ways and a peculiar thing happened to me. I rebelled, quit the spiritual practices entirely and did some ignorant things. I immediately began feeling myself drifting farther and farther from Krishna." What follows is an amazing journey wherein Anandamaya das not only returns to his Krishna Consciousness, but over time, has a deep spiritual realization which will change his life forever. 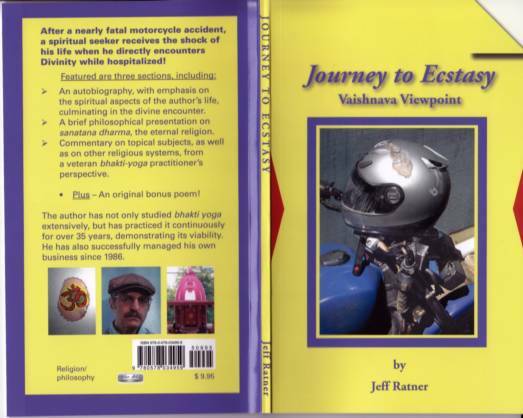 The soft-cover version, 80 pages, including 10 black & white photos, is available at www.journeytoecstasy.com. The Amazon Kindle version, which works only with the Kindle electronic book reader, is available on Amazon.